With over 40 years’ experience, Carron Marquees are proud to provide an all-encompassing hiring service for premier marquees and their ancillary items. As part of our service to you, we will perform a full requirement analysis on your event to establish your individual power needs. From here, the correct power generator will be chosen, including back-up machinery where required and delivered to your event. Our expert team will work with you to find the ideal location and perform a full set-up, keeping safety and efficient running at the forefront of importance. During your event, Carron Marquees will be on-call to answer any questions or queries you may have. In the event of an emergency, we will provide a swift and effective solution to ensure your event gets back up and running as quickly as possible. Our super silent generators are chosen for their discrete running. We want you to enjoy the laughs, chat and music that makes your event so unique. During the planning process, we will calculate the total load you require to work out the most suitable and economical option for your special day. Contact us today to book an initial, no-obligation consultation. We encourage regular contact to ensure we capture the dreams and aspirations of your event and turn them into a reality. Discover why so many people trust Carron Marquees when it comes to housing, designing and powering their outdoor event. The generator chosen and provided by us for your event will be based on the detailed guide below. Hosting an event outdoors can be a brilliant way of optimising on space and location. Unlike indoor events that are usually restricted on guest numbers, available layout alterations and, sometimes, noise allowances, an outdoor event offers a greater freedom to the organiser. From underneath a temporary shelter, guests can fully appreciate the effort that has gone into organising your event, all the time embracing the beauty of nature and sheltering should the weather suddenly get colder or wet. Outdoor events are an integral part of British life – even the Royal family are known for their adoration of garden parties. For generations we have rushed to festivals, celebrated the joining of two people with outdoor wedding receptions and enjoyed quality time with our colleagues through outdoor corporate hospitality events. But, what requirement do all of these outdoor events have in common? Power. Powering your outdoor event is a factor that should be considered at the very start of your planning process. How will you ensure that those speakers emit a noise that reaches further into the crowd? Or how will your guests dance the night away without music and the gentle glow of temporary lighting fixtures? For many, the best choice for their celebration is to hire a power generator, suitable for use during temporary outdoor events. Unless you’re an event planning company, it is highly unlikely that power generators are something you are overly familiar with. With so many people depending on you to make sure the event is a roaring success, we understand how important it is to get this bit right. That’s why we’ve created this detailed guide, to help you navigate how best to hire a power generator for your event. Why hire a power generator? There are a whole host of different power generators out there. Some are used to power large areas in the event of a power cut or major natural disaster. Some are used by homeowners to bypass the loss of power caused during building work. And then some, like the ones we’ll be discussing today, are used to power outdoor events. So, why should you choose to hire a power generator for your event? By providing portable power, you have a greater flexibility when it comes to choosing the event location. Sure, you could place your marquee next to a stationary building and attempt to syphon power from the mains electricity supply. But, other than the power potentially not being strong enough to cope with two locations, what if your event décor would look better freestanding within a field? What if that striking view you envisioned through the marquee bay windows was obstructed by an unsightly tower block? Portable power generators allow you to take your event to nearly any location, without being tied to a mains power supply. By freeing up your choice of venue, you open the doors for your guests to appreciate much more than just your exquisite décor. The beauty of the English countryside comes to life when your guests are allowed to wander through it uninterrupted – before scurrying back to the brightly lit and warm marquee, fully powered with a functional generator. Generators are an expensive, specialist piece of machinery. With prices upwards of £10,000, purchasing a generator is an expensive investment and one that most individuals or companies can ill afford. If outdoor events are a regular feature in your yearly calendar – perhaps you’re part of an events company specialising in outdoor festivals or weddings – then this investment may be entirely practical. However, for most businesses, outdoor events are an occasional occurrence. There is so much more that goes into planning, designing and executing your plans for an event, your budget is best spent elsewhere. For this reason, hiring a power generator is a practical option. Alongside the money, generators for outdoor events are large and bulky in dimension. They are hard to store unless you have a specialist warehouse and require regular maintenance to ensure they comply with current electrical requirements. When you hire a power generator, it will arrive with documentation to show it has passed all relevant tests. For a one-off fee, you’ll be able to utilise the power it provides and enjoy the night with your guests. Once your event has finished, it will be collected and taken off by a specialist team – one less thing you have to worry about. What type of events will need a power generator? Outdoor events come in many shapes and sizes. There are some that require continual power throughout and others that have peaks and drops in power consumption. Here are just a few examples where an outdoor power generator could be a practical option. 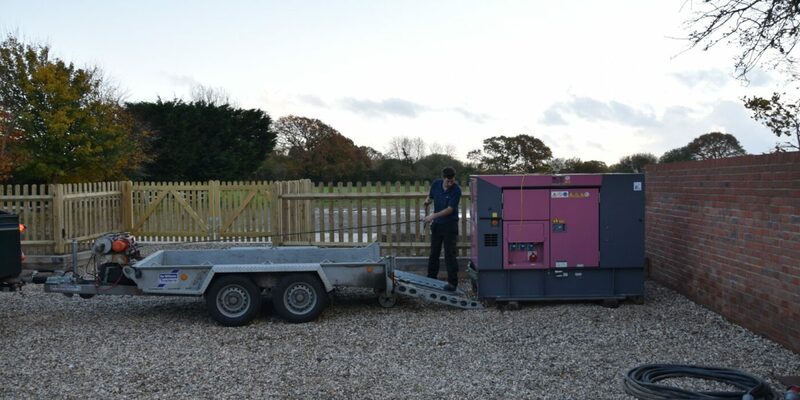 Wherever you have a large number of people relying on an external or temporary building to provide shelter during an event, a power generator could be your best choice. How do you calculate the size of generator required? In order to calculate the size of the generator required you need to find out the total wattage required. You should make a list of every electrical item that needs to be plugged in for example Lighting, heating, catering equipment, band equipment (as a general rule a caterer/entertainer will be able to give you their information). The total wattage required will then give you how much electrical power is needed by your equipment and so enable you to work out the minimum electrical input needed from a generator. Wattage information can be found either on the equipment’s silver nameplate or in the manufacturer’s guide. Note: Not all electrical equipment will have the same start and run wattage – it takes more energy to start equipment than to keep it running! You will need to factor in the initial surge required. The international standard rate for generators is a power factor of 0.8. This means that generators are generally are 80% efficient – we have to account for this when choosing the size of machine required. 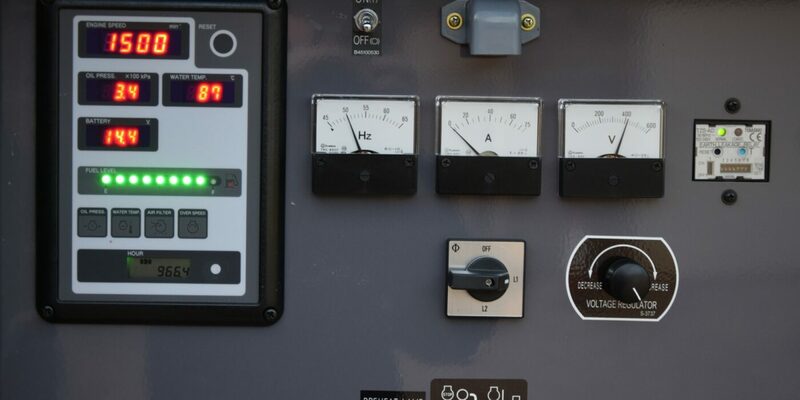 The power factor is crucial for matching the size of your load (wattage) to the size of generator required, for example, a generator that is rated at 60kVA and has a 0.8pf will be too small to power equipment that requires 60kW of actual power. There are a number of key factors you should consider when hiring a power generator that we will discuss in further detail below. 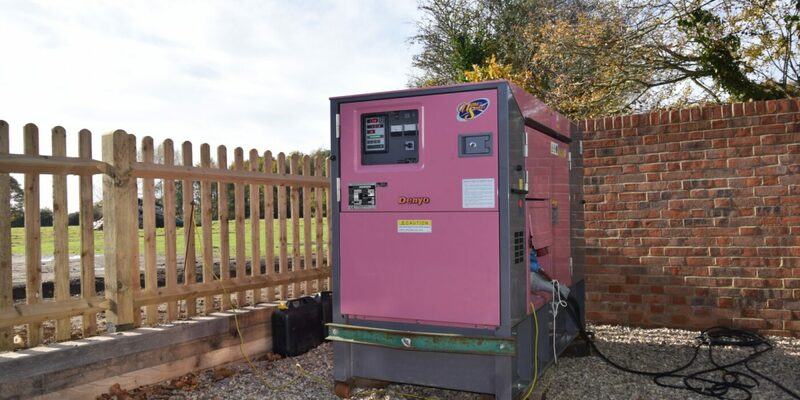 Power generators offer a great deal of flexibility when it comes to deciding on your event location, however certain event sites can be difficult to reach. Make sure to share information about your location with the company you choose to hire from. Some remote locations may require all-terrain access or telemetry services, which allow the team to remotely control your generators from digitised equipment. In the event of an emergency, this could mean the difference between an hour’s blackout or a complete event shut down. Power generators are stored outside of a marquee or the enclosed environment. Most generators are built for this, with a protective and durable casing to withstand different weather conditions. However, finding out whether rain or snow is forecast for your event date could provide the hire company with helpful information on where to position it. In some instances, generators can be placed under a protective cover, however ample ventilation is required to prevent heating up. The hire company should advise you on the best solution for this, should your event take place during Winter or Autumn. Will your event require a full sit down meal, buffet or canapes? Caterers are the main users of power and it is important to factor their requirements in when deciding on the size of generator required. Another major power user will be the band/DJ, they will be happy to let you know what their equipment needs. Different events will need different power supplies. Festivals, for example, play loud music and flashing lights throughout the entire day. On the flip side, a business meeting may just need to power internal lighting and computer machinery for an afternoon group task. Make a note of the times during your event where the electricity or heating needs may increase or decrease. Try to consider all the different places where power could be needed – remember, places like port-a-loos require lighting at all times, as do cloak rooms and even outdoor heaters for the smoking section. Power is measured in KVA, which is a measure of apparent power. This information tells you the total of power use in a system. When you hire a power generator – which come anywhere between 20KVA and 1500KVA – this information will tell you the electricity capacity it is capable of producing. Seek expert advice when choosing the right power consumption for your needs. 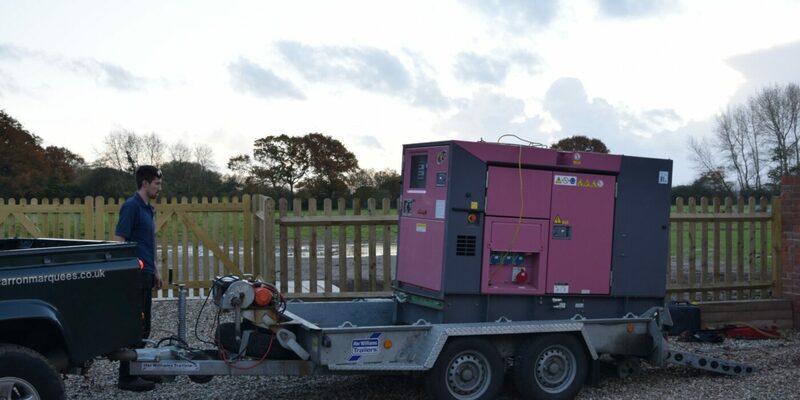 Not all festivals, meetings or weddings require the same amount of electricity or heating so the generator you need will be a bespoke choice specific to your needs. We can advise on this during the build-up to the event. There is no harm in using this information to determine which power generator you think you may need. However, seeking a professional second opinion reduces the risk of potential outages or broken circuits if the power supply isn’t sufficient. All power generators produce some level of noise. This is inevitable due to the power that they need to generate during an event. Here are Carron Marquees, our generators are some of the quietest on the market – in fact they are described by the manufacturer as “super silent”!. Not to overshadow the Best Man Speech or that important Final Thought you want to leave all your colleagues with, they will run smoothly without causing distraction. When you consider generator volume, layout is a good place to start. Keep your power generator away from microphones or stages where they could cause direct interruption to any noise. Try to place it as far away from social gathering points as possible or closer to louder, disguising areas (such as theme attractions or loud speakers). While we’re speaking about layout, let’s take into consideration your space availability. Power generators that produce high levels of power can be large in dimension. They also require a flat, hard surface with plenty of ventilation to allow them to continue pushing electricity and heat into your venue consistently. When designing your layout, take these factors into consideration. The location for the generator also needs to be accessible with a vehicle. Speak to a professional to discuss the required layout in terms of cable length and other non-adjustable variables. From here, you should be able to design and create a useable layout for your visitors. Use accessories and seating arrangements to draw people away from the generators and to quieter, more relaxing spaces. Or position the generator away from public spaces such as behind larger furniture items to maintain the interior design you’re going for. It is important to site the generator within 30m of the distribution board – any further than this will result in voltage drop, which in turn will mean that a larger capacity of generator will be required. Most power generators will run on one of two kinds of fuel – diesel or liquid petroleum gas. Diesel is the traditional method and one that is still regularly chosen today. Diesel burns slower than petrol and can provide longer power production. It is also a cheap fuel and causes minimal damage to the generator over time. It has a lower ignition risk in comparison to petrol and lasts much longer. Fuel management is another factor to consider when choosing your power generator. Will your event need constant electricity or will the dips allow you to preserve the amount of fuel needed? 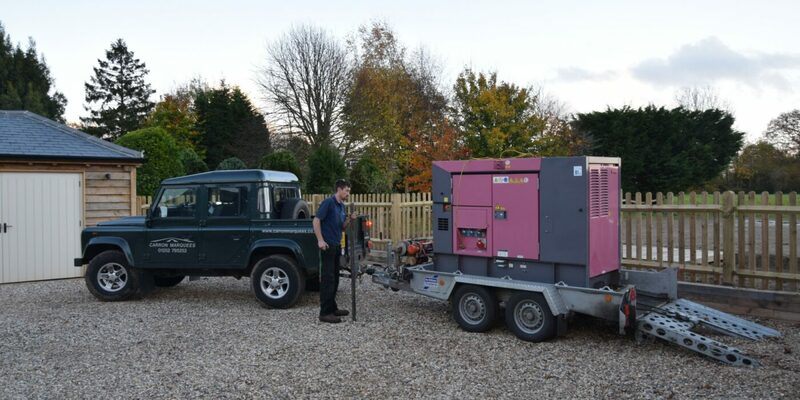 Most generators will have an ample tank which you can fill prior to the event without the need for top ups. However, a professional will be able to advise whether any additional fuel should be kept on hand, so understanding your requirements in as much detail as possible is vital. We can advise on this and refuel during the event if required. The type of power generator available to you will largely depend on the event and power requirements you have. Here at Carron Marquees, our experts can provide you with information and advice to help partner you up with the ideal generator for your needs. We have three different sizes power generator options to suit different group and location sizes, so give us a call today to discuss the different types available and the most economical choice for your event. It is worth noting that ordinarily there are two main types of power generator on the market. A Simple/Small generator will produce under 6KVA. This is generally too low for a large-scale event but can be used by smaller, residential environments for personal jobs. These machines can be easily installed and maintained by any competent person. In comparison, and the ones you’ll be looking at for your event, Large/Complex systems are usually best installed and managed by an electrically skilled professional. With any large-scale event, there is the potential for something to go wrong. Outages, power cuts or other situations mean it is always worth considering your back up requirements. If your location is largely remote, chances are the hire company may not be able to get to you straight away. In the worst-case situation, this could leave your guests plunged into darkness and freezing cold. Consider having a back-up generator on site, ready to go should the main option fail. If this can keep your location powered sufficiently in the event of an emergency, it will give the hire company time to resolve the issue to get you back up and running with minimal interruption. There are a number of other things you need to consider before the event in question to make sure you are prepared for your power generator. Most machines will require minimal set-up time. However, the hire company should be on hand to provide professional assistance with this at all times. If you have any queries, contact them directly to make sure that these potentially hazardous machines are installed correctly and safely. Factor in the set-up time to your overall preparation period – you don’t want guests arriving when the marquee is still darkened without light. In line with this, your generator should be earthed to provide a safer and quicker route for electricity to travel through in the event of an emergency. Cables should not present a tripping hazard to your guests and should be taped down securely with cable floor strips or covered with fitted carpet squares. A professional should be able to analyse the scene during installation the highlight and solve any potentially hazardous areas before your event takes place. Under British law, a power generator should comply with British Standard BS 7671. This legal obligation ensures that the machine should have correct wiring to reduce the risk of shocks or fire. 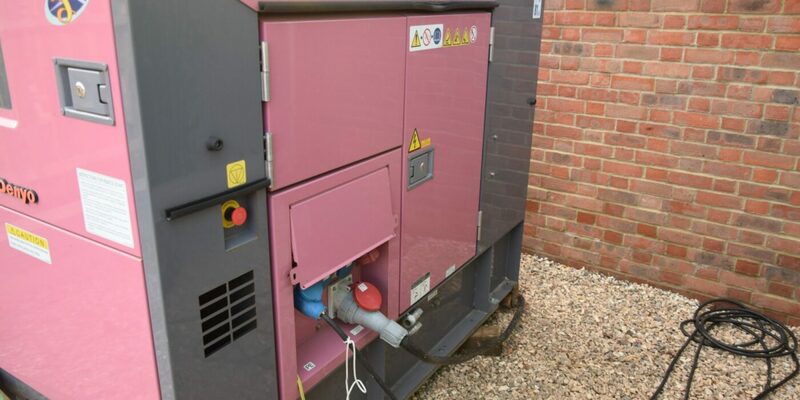 Before your generator is delivered, ask the hire company to provide you with documentation regarding their machine compliance with this standard. In addition, all electrical items should be PAT tested and shipped with documentation to show this too. All of our generators, here at Carron Marquees, are regularly checked to ensure they comply with all current safety regulations and have the relevant safety certificates. Keep your generator outside at all times. Ensure your generator outlet is directly through a PAT tested extension lead. If using an extension lead, the suitable wattage should be, at least, equal to the sum of watts on the generator and be a maximum of 30m long. Insurance – Consider taking out an insurance policy to cover you in the event that something goes wrong with your generator. Events are considerable investments for most companies so it helps to protect yourself as much as possible. Outages – In some situations, an outage (power cut) is unavoidable. However, they can be detrimental to your event, slowing it down or even stopping it entirely in its tracks. If you do have an outage remember to immediately unplug any electrical components to prevent short circuits. Make sure all electronics are kept away from moisture and avoid any that may have come in contact with water as these can be hazardous. Speak to your guests and keep them as calm as possible – most power generator hire companies will have an emergency response team on hand to deal with these set-backs as quick as possible. Back-Up generators – As we have mentioned before, having a back-up generator provides power if your main unit goes down. Saving you money and precious time, all event planners should consider additional generators and fuel for such an emergency. Additional safety equipment – Along with your generator, there are other items of equipment that can improve the safety of your event location. Fuel Tanks help to prevent potentially hazardous spills and keep your environment safe at all times. Speak to your hire company and discuss the added features that could keep your guests happy and safe throughout the day and night.